Approximate site of the former gunpowder magazine, well away from the gunpowder mill. The two were connected by a tramway. Temporary trestle bridge carrying the 3ft gauge construction railway. Load-carrying vessel (sometimes known as a Gondola) suspended from wires across the valley. Close examination of the photo revels the wires in several places. The suspending metalwork on each side of the valley is quite distinctive. 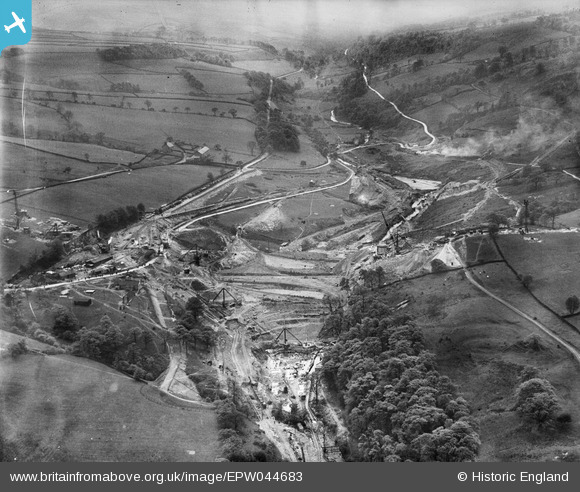 Self-acting incline to Issue Tor Quarry near the 1000ft contour, opened to extract stone for use in building the dam. Trackbed of Bunsall Upper Incline on the Cromford and High Peak Railway. The incline was closed, along with the rest of the line between Shallcross goods yard and Ladmanlow, in 1892 and the tracks were lifted by 1894. The trackbed now forms part of a modern road. Trackbed of the Cromford and High Peak Railway. This stretch opened in 1831 and closed in 1892. Tracks here were lifted by 1894.